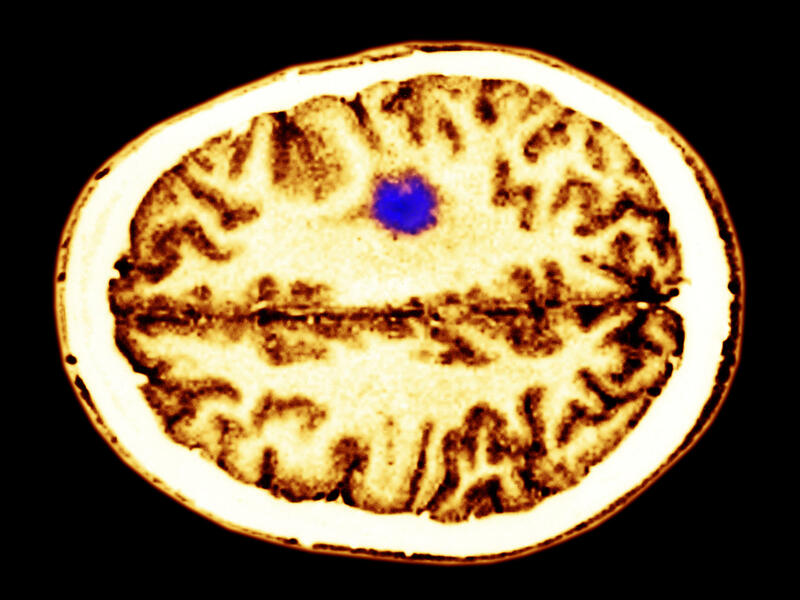 A color-enhanced cerebral MRI showing a glioma tumor. 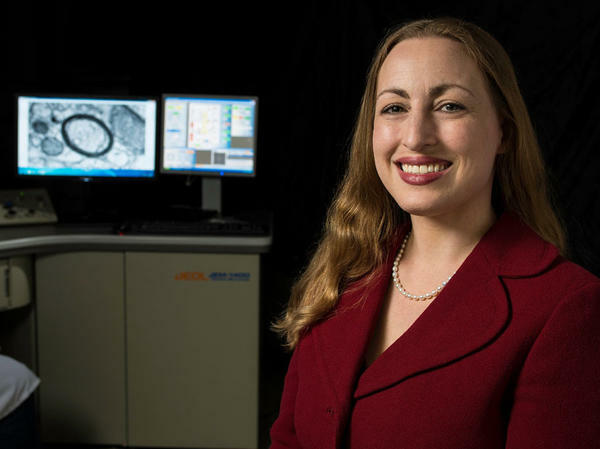 Dr. Michelle Monje wanted to figure out how tumors hijacked the myelination process. The simple act of thinking can accelerate the growth of many brain tumors. That's the conclusion of a paper in Cell published Thursday that showed how activity in the cerebral cortex affected high-grade gliomas, which represent about 80 percent of all malignant brain tumors in people. "This tumor is utilizing the core function of the brain, thinking, to promote its own growth," says Michelle Monje, a researcher and neurologist at Stanford who is the paper's senior author. In theory, doctors could slow the growth of these tumors by using sedatives or other drugs to reduce mental activity, Monje says. But that's not a viable option because it wouldn't eliminate the tumor and "we don't want to stop people with brain tumors from thinking or learning or being active." Even so, the discovery suggests other ways to slow down some of the most difficult brain tumors, says Tracy Batchelor, who directs the neuro-oncology program at Massachusetts General Hospital and was not involved in the research. "We really don't have any curative treatments for high-grade gliomas," Batchelor says. The discovery of a link between tumor growth and brain activity "has opened up a window into potential therapeutic interventions," he says. The discovery came from a team of scientists who studied human glioma tumors implanted in mouse brains. The scientists used a technique called optogenetics, which uses light to control brain cells, to increase the activity of cells near the tumors. The team wanted to know whether this high level of activity would make the glioma grow more quickly. "And it turns out that it did,"
The discovery of a link between tumor growth and brain activity is a byproduct of Monje's career-long quest to help to help children with a rare and deadly form of brain cancer. The cancer is called diffuse intrinsic pontine glioma, or DIPG. Monje saw her first case when she was still in medical school. "I cared for a little girl who had diffuse intrinsic pontine glioma and I was just so struck by our failure to treat this disease," she says. DIPG strikes about 200 children a year, often at around age 6. It can't be treated with surgery because the tumor cells become entwined with healthy cells in the brain stem. Children with DIPG typically live about nine months after they are diagnosed. "This is a disease with a terrible prognosis," Monje says. "And it's one that unfortunately we haven't been able to touch with interventions for decades." Monje wanted to change that. So after receiving her M.D. and Ph.D. from Stanford in 2004, she began studying DIPG tumor cells as well as the part of the brain in which they grow, the brain stem. She began to suspect that this cancer was somehow hijacking a process called myelination, which happens in the brains of healthy kids. Myelination creates a layer of insulation around nerve fibers, which allows them to carry signals more quickly and efficiently. Last year, Monje and a team of researchers showed that the cells responsible for myelination began to grow rapidly in response to high levels of brain activity. "That was an intriguing finding and it was consistent with our idea that activity in the brain, thinking, planning, using your brain, might be promoting the cancer arising within it," she says. The mouse experiment confirmed Monje's suspicion. Another experiment showed that the glioma cells were indeed growing in response to the chemical signals that usually lead to myelination. One striking finding, though, was that the link between brain activity and tumor growth wasn't limited to DIPG, the rare childhood tumor Monje had been studying since medical school. Her team found that a range of deadly gliomas grow faster when they're near highly active nerve cells. "This work has much broader implications for brain tumors," says Batchelor. "It's not just pediatric tumors, it's pediatric and adult. And it's not just one particular type of glioma. This has potential implications across the entire family of gliomas in the brain." Batchelor says Monje's research suggests a new way to slow down these tumors — by interrupting the pathways linking brain activity to tumor growth. Monje says she is encouraged that her work has led to a better understanding of DIPG and other deadly childhood tumors. But she says it's still hard to feel gratified. "It will be gratifying when we make some difference for these kids," she says. A new study finds that the simple act of thinking can accelerate the growth of many brain tumors. The discovery came to light through one doctor's career-long effort to help children with a rare and deadly form of brain cancer. NPR's Jon Hamilton has the story. JON HAMILTON, BYLINE: The cancer is called diffuse intrinsic pontine glioma, or DIPG. Michelle Monje, a researcher and neurologist at Stanford, saw her first case when she was in medical school. MICHELLE MONJE: I cared for a little girl who had diffuse intrinsic pontine glioma, and I was just so struck by our failure to treat this disease. HAMILTON: In the U.S., DIPG strikes about 200 children a year, often at around age 6. It can't be treated with surgery because the tumor cells become entwined with healthy cells in the brain stem. Monje says kids with DIPG typically live about nine months. MONJE: This is a disease with a terrible prognosis and it's one that unfortunately we haven't been able to touch with interventions for decades. HAMILTON: Monje wanted to change that. So after receiving her M.D. and Ph.D. from Stanford in 2004, she began studying DIPG tumor cells as well as the part of the brain in which they grow. And Monje began to suspect that this cancer was somehow hijacking a normal process that happens in the brains of healthy kids. MONJE: All arrows were pointing towards a developmental process that relates to forming the insulation on the nerve fibers within the brain. That's a process which is called myelination. HAMILTON: Last year, Monje and a team of researchers showed that cells responsible for myelination began to grow rapidly in response to high levels of brain activity. MONJE: That was an intriguing finding and it was consistent with our idea that activity in the brain - thinking, planning, using your brain - might be promoting the cancer arising within it. HAMILTON: To find out for sure, Monje and her team studied mice that had human glioma cells implanted in a part of their brains. MONJE: We started with an experiment to see if the mouse used this part of its brain more, if it was more active, if that made the glioma grow more. And it turns out that it did. HAMILTON: Other experiments showed that the glioma cells were responding to the chemical signals that usually lead to myelination. As Monje had suspected, the cancer had hijacked this process. MONJE: This tumor is utilizing a core function of the brain, the core function of the brain - thinking - to promote its own growth. HAMILTON: And it wasn't just DIPG, the rare childhood tumor Monje had been studying since medical school. Her team found that a range of deadly gliomas grow faster when they're near highly-active nerve cells. Tracy Batchelor, who directs the neuro-oncology program at Massachusetts General Hospital, says that's an important finding. TRACY BATCHELOR: This work has much broader implications for brain tumors. It's not just pediatric tumors. It's pediatric and adult, and it's not just on one particular type of glioma. This has potential implications across the whole family of gliomas in the brain. HAMILTON: Gliomas represent about 80 percent of all malignant brain tumors and kill thousands of people each year. Batchelor says malignant gliomas are extremely difficult to stop. BATCHELOR: They are usually resistant to the standard treatments that we apply. Treatments can be somewhat effective, but we really don't have any curative treatments for high-grade gliomas in adults or in children. HAMILTON: Batchelor says Monje's research suggests a new way to slow down these tumors, by interrupting the pathways linking brain activity to tumor growth. BATCHELOR: It has opened up a window into potential therapeutic interventions where we might begin to regulate these pathways so that they're not always firing and allowing the tumor to grow. HAMILTON: As for Michelle Monje, she is encouraged that scientists now have a better understanding of DIPG and other deadly childhood tumors. But she says that on its own isn't gratifying to her. MONJE: It will be gratifying when we make some difference for these kids. HAMILTON: The new study appears in the journal Cell. Jon Hamilton, NPR News. Transcript provided by NPR, Copyright NPR.